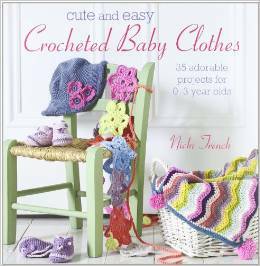 Keep your little one looking adorable and feeling comfortable with Cute and Easy Crocheted Baby Clothes. Using only the softest yarns, crochet expert Nicki Trench has created this striking collection of jackets, dresses, booties, hats and more that make the perfect gift for newborns and toddlers. Crochet Know-how covers all the techniques you will need and is a great resource for more confident crocheters to brush up on a stitch. In Sweaters and Cardigans you will find clothes to keep little ones warm and cozy, such as the Breton-style sweater for a boy or the cardigan with embroidered daisies for a girl.